John, thank you SO much for everything. The food was absolutely delicious and the staff was amazing. Everyone loved the bartenders! And Claudia (I think that’s her name) was so helpful and made sure we ate! Thank you again – we are willing to post reviews anywhere you want us to. Sorry this letter is so overdue! You all catered our wedding reception at the barn on July 22nd and we just wanted to share with you how grateful we are to all of you for making the evening so incredible and memorable. John, from the very start you worked with us to create a custom menu with all our favorites and the food was absolutely fantastic! When we returned from our honeymoon and talked with family and friends about the reception everyone raved about the food. You all really went above and beyond, it was superb! 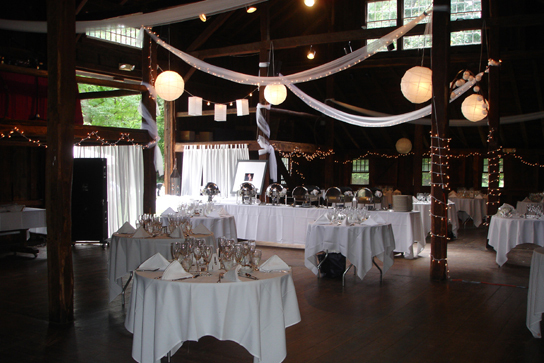 The barn itself looked beautiful; you did such a nice job finishing what we started when you set up all of the tables, bar, food station etc. It was just what we were hoping for. I am sure all couples think that their wedding was “the best” and we are no exceptions, but I think many of our guests share that opinion of the night’s festivities. We have been spreading our raving reviews of you all over town and will certainly use you all again should we need catering for any future family events (although our next party will probably be somewhat smaller!) Thank you all so much for all of your hard word and effort, you exceeded all of our expectations and you have certainly mastered the art of cooking affordable, gourmet food for large gatherings. Our best to all of you and thank you deeply! Dear John, Our special thanks for helping to make our son’s wedding day so memorable. Ryan and Kristen were so thrilled with all the appetizers, the dinner, and the wonderful staff you provided. We are extremely appreciative of all the time and effort you put into making sure the day went well. The bar area looked top shelf, the food was 5 star, and we were so pleased that you honored everything you said you would do for us. From the bottom of our hearts, we thank you. When we look back upon July 12th, 2014, we will think of you and how happy you made us. Dear John, It has been wonderful working with you. Thank you for all your efforts in making our daughter’s wedding reception so special. Dear John, Nearly a month has passes since our daughter Jessica’s wedding on August 16th and we want you to know that we are still receiving compliments on the amazing food we offered our guests thanks to you. What to compliment first? Your wonderful, personal service; so patient with nervous bride and parents, your attention to detail and willingness to go the extra step to ensure that our experience was the best it could be. Thank you for all that. You and your wonderful staff went well beyond what was expected. The quality of the food was superb, fresh and well served. We had people tell us that this was some of the best they have ever had at a large function such as ours. Thank you so much for making our special occasion so wonderful. See you when we come by the Village Pizza Restaurant for lunch. John, we both wanted to thank you for doing such an excellent job with our july 3rd wedding. The presentation was beautiful and the food was delicious. Our guests are still raving about how wonderful it all was. Your hard work and dedication were obvious, and we will certainly recommend you to anyone and everyone! Thank you again! Dear John, I just wanted to thank you and your staff for the wonderful presentation you displayed at our wedding. The barn looked beautiful and the food was perfect! You actually got the most compliments on the pieces of pizza. Everyone raved about the pizza, so I told them about Village Pizza. Josh and I really enjoyed working with you. You will be highly recommended. Thanks Again. John, Thank you for making our wedding such a special event. (6/18/03) You and your staff provided excellent service, and we thank you in particular for tour attention to detail. We hope to come by your restaurant soon for lunch or dinner! John, a note of thanks to all of your staff for a fantastic catering experience! Everyone raved about the food! Please use me as a reference any time! John, I wanted to send a (very belated) thank you for catering our wedding, 22nd October, 2005. I’m so sorry this has taken so long to get to you but the thanks is still very alive in our hearts for your professionalism, terrific food, good cheer, and the most wonderful memories we could have hoped for. I hope this note finds you, and the Village Tavern. Again, thank you for making our big day so special. Dear John and Art, Thank you so much for donating the pizzas for our first meeting of the year. Delicious, as always! We appreciate your kindness. John, Colleen and I wanted to thank you again for doing such a wonderful job for our wedding at the barn. Your staff was amazing. We have gotten so many compliments pertaining to the food. Please feel free to contact us if you ever need a referral. Thanks again. John, many thanks to you and your team for making Maggie’s wedding reception so delicious! Were grateful for your help. God’s Blessings! Dear John and Village Catering staff, Kevin and I wanted to thank you so much for the amazing job you did catering our wedding at the Webb Barn on July 10th. The food was wonderful, and we were so impressed with how attentive, helpful, and kind your staff was to us and all of our guests. The day went so smoothly and we have you to thank for that! We couldn’t be happier with everything. Thanks again!